Comb Jellies are another of those peculiar presences that one can scarcely imagine being a real, proper animal, let alone a very hungry predator of the high seas. They look somewhat akin to jellyfish, but that's probably because near enough anything composed mostly of jelly can't help but look at least a bit like whatever the most famous jelly thing happens to be. 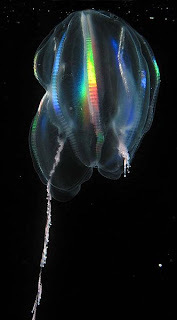 Comb Jellies actually have an entire phylum all to themselves - Ctenophora, and under this banner they have conquered the world's oceans from pole to pole and surface to floor. There are only about 150 or so species and while they are nowhere near as diverse as Cnidaria in general, they are certainly more varied than jellyfish. 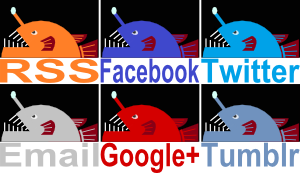 So what ties all the Comb Jellies together? Jelly, for one thing. Ctenophores aren't a great deal more than a load of jelly held between two layers of skin, and the jelly itself isn't much more than water. They have no brain, which you probably suspected, instead making use of a nerve net just as jellyfish do. They have a mouth where the food goes and an internal cavity which serves as a stomach. Food here is various forms of plankton. 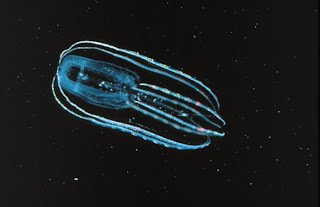 A tiny 1 mm long Comb Jelly will eat microscopic organisms and maybe eggs. 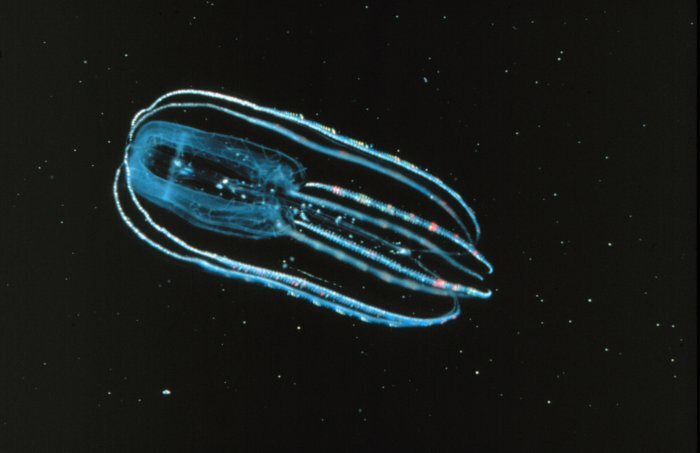 Larger ones could manage adult Copepods and maybe even small Krill, while some eat Salps, jellyfish or other Comb Jellies. Of course, they have to catch them first! To actually grab hold of prey, Comb Jellies use a pair of retractable tentacles covered in colloblasts. These are special cells with a kind of sticky glue used to entangle food; they don't sting like Cnidarians do. The tentacles often also have a fringe of little tentacles branching off the main one, these are delightfully named "tentilla". Some Comb Jellies use these unique, sticky tentacles in a slightly different way. They can have large, muscular lobes around their mouth, almost like huge lips. The tentacles are arranged around these lobes and there might even be cilia in there to create a current to bring plankton straight to the mouth. Some have not so much a mouth as a gaping maw for eating other Comb Jellies. They might even have tough cilia that are fused together so they can be used as teeth, biting chunks out of things they can't swallow whole. These don't need to use tentacles at all. The biggest Comb Jellies are ribbon shaped. Their long, thin bodies can reach over a metre in length and they can get around using undulations rather than cilia. Some Comb Jellies hardly get around at all! They are flattened and live on the ocean floor, spending all their time stuck to rocks or algae. They are also coloured in order to help out with camouflage and they have long tentacles with long tentilla to catch as much food as they can. It's all much more interesting than I'd ever thought, and I can't wait to explore some of these oddities! When it comes to reproduction, Comb Jellies are almost all hermaphrodite. Sperm and eggs are simply released into the water and what will be, will be. They do this when there is enough food but they'll stop once they start getting too hungry. This is a great idea, but they can go one step further and actually shrink in size if food continues to be scarce! If a phytoplankton bloom causes a huge increase in Salps, Copepods or Krill, Ctenophores are all set to start eating, growing and reproducing on a potentially massive scale. Very clever! Particularly for something that could so easily be described as a bag of water. These creatures are actually a part of the underwater Las Vegas scene. Haha! They're utterly mesmerising. I little bit of that in a casino never hurts the casino owner!